With the Redskins winning this afternoon, Dallas gets a much-needed victory against the Eagles to keep pace in the NFC East. Dak Prescott was under pressure often but made big throws in crucial spots on his way to 270 yards. His favorite target was Amari Cooper, who caught six passes for 75 yards on 10 targets. The offensive player of the game for the Cowboys was clearly Ezekiel Elliott, who sprung through to the second level on a number of runs and gashed the Eagles’ defense for 151 yards on 19 carries. Elliott has surpassed 100 rushing yards four times this season and continues to be the vital component to the Cowboys’ offensive success. Leighton Vander Esch was all over the field for the Cowboys’ defense, who started in place of injured linebacker Sean Lee. He made the important tackle on 3rd & 2 with two minutes left in the game to put the Eagles in 4th & 7 and ended up forcing the Eagles into a failed last-ditch effort on fourth down. And Vander Esch also made a tackle to stop Nelson Agholor on a jet sweep where he was able to track him and make a quick stop when Agholor just needed two yards to score a touchdown. Demarcus Lawerence, while not recording a sack, made his presence felt on multiple plays. He was part of the tackle that stopped the Eagles converting a fourth down in the second quarter. Lawerence also caused some issues in the passing game, as he was the one who hit Wentz in the last drive to force an incompletion. The Eagles pressured Prescott on numerous occasions and recorded four sacks. Brandon Graham recorded 1.5 of them to go along with a couple quarterback hits. Fletcher Cox was perhaps the most disruptive player among the front seven against the run, but the unit struggled as a whole, surrendering over six yards per carry on 28 rushes. Rasul Douglas had a tough night going against Cooper and Allen Hurns, as he was beaten in coverage on a few occasions which yielded big gains. 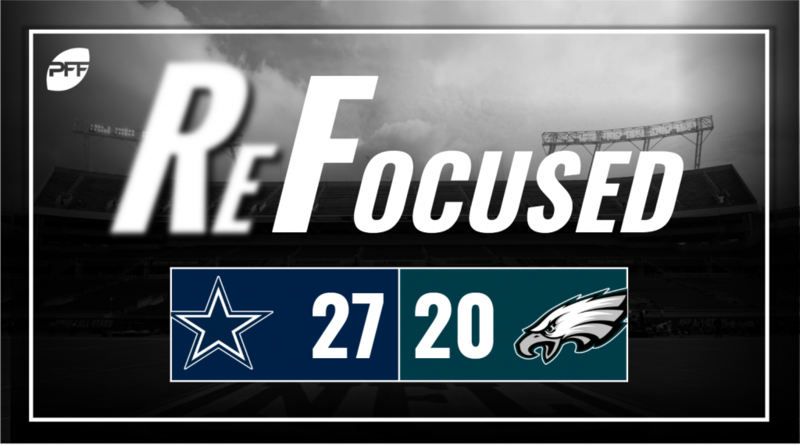 After limiting the Cowboys’ offense in the first half, the Eagles allowed the Cowboys to gash them with a number of big plays. Carson Wentz was anything but the problem for the Eagles. Wentz put up 360 yards through the air, most of which coming on deep, downfield passes. Zach Ertz was the weapon that Wentz hit time after time, leading to 14 catches for 145 yards, and 68 of those yards came on the last drive with the Cowboys in prevent defense. Ertz did have a drop but was able to score two touchdowns to give the Eagles a chance to win the game. Elliot propelled the Cowboys to victory in a key division matchup. Dallas created movement at the line of scrimmage and averaged over six yards per carry on their way to their fourth win, keeping pace with the division-leading Redskins. In an evenly fought game, the Eagles were always playing catch up after a first-quarter interception. After that point, the Eagles never got the stop they needed in the second half to take the lead.